If you’ve been doing any kind of SEO for your website and you haven’t heard of Brian Dean from Backlinko, stop right now and read this interview. No offense to the SEO industry, but there’s a lot of garbage out there when it comes to learning SEO tactics and strategies. Fortunately for us, there are still diamonds in the rough like Brian Dean. 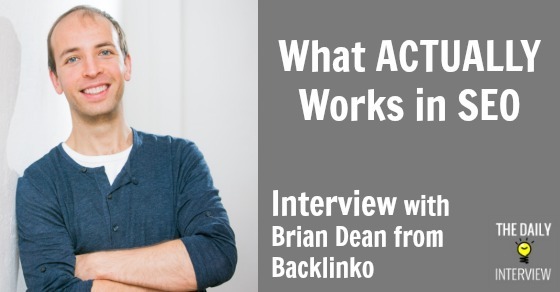 Anyway, in this interview, Brian tells us a little bit about his journey and then discusses some SEO tactics that are actually working today. One of his big takeaways? The SEO landscape doesn’t change nearly as quickly as the other SEO “gurus” would lead you to believe. Brian, when it comes to search engine optimization, you’re one of my favorite people to learn from. The resources and articles you have at your site, Backlinko, are incredibly valuable. Tell us a bit about yourself and your journey – how did you get into the world of SEO? Did you used to work a “normal” job before, and if so, how did you make the transition to starting your own business? Thanks Eric. I work really hard on the site so that means a lot to hear. My journey into SEO was a bit funky. July 2008: After a lot of soul searching I decided to quit graduate school. Because I already had a Master’s degree from a good school, I think landing a job would be a breeze. Things didn’t work out that way. End up broke in my parent’s basement frantically job-hunting. August 2008: Stumbled on The 4-Hour Workweek at a Borders near my house. 10 pages in, my world view completely flipped. September 2008: Start my first “muse business”: a nutrition-focused information product. Get a job as a dietitian in NYC to pay the bills. July 2009: Not making any progress with my business. Shift gears and go full-on into freelance writing. Quit my job 4-months later to freelance full-time. March 2010: Book a one-way flight to Bangkok. Spend the next 3-years living/working/backpacking in Asia. October 2011: Reeling from Google’s Panda update, my biggest client lays off all of their writers (including me). 90% of my income vanishes. Start my SEO agency from a cafe in Phnom Penh, Cambodia (really). June 2012: Move to Berlin, Germany to focus on my SEO business full-time. Finally, everything “clicks”. A few months later I have my first $10,000 month. December 2012: Started Backlinko. That’s been my focus over the last year. What has been your greatest success (or successes) so far with your online business? The first was when I made $10,000 in a single month from affiliate commissions. And it all came from a single site (authority sites FTW!). The other has been Backlinko’s growth in general. In a year the blog has gone from an idea to 40,000 unique visitors per month. It’s also listed as one of the Top 100 business blogs online (according to Technorati). SEO is a tricky topic and it’s a constantly changing environment – there are right ways to do it, and ways that could push your website into a search engine black hole for all of eternity. I obviously can’t ask you to give a full outline of all good SEO strategies, but I will ask: What strategy is working best for you (or people you’ve helped) today? 1. Create something in your niche (or if you’re in a weird/obscure niche, a related industry) that’s mind-blowingly epic. Don’t hold back. Create something that provides so much value that people literally say “wow” out loud when they see it. (Examples of this include Neil Patel’s Advanced Guide to SEO, Eric’s own 142 ways to make money online and this list of 100 ways to conserve). 2. Promote the heck out of the content using industry forums (gold mine), Reddit, StumbleUpon Paid Discovery and social media. 3. Email outreach, AKA the secret sauce of content promotion. It’s not really a secret. It’s more that most people are too intimidated by it to actually make it work. As long as you’re not pushy, you can land links to your epic content simply by emailing a bunch of people about it. You’ll have even more success if you use something like Broken Link Building which has a really impressive conversion rate. Naturally attracting backlinks is certainly a part of the optimal white-hat SEO (i.e. “the right way” to do SEO) strategy. When it comes to content strategy, what are the types of content that have the greatest success rate with attracting natural backlinks? Furthermore, what’s your favorite way to actually promote this type of content? LOVE this question. Most people think that “great content” is enough. It’s not. But as you alluded to, there are certain types of great content that work better than others. 1. Interactive content (like a map): Interactive content is HUGE right now. But it doesn’t have to be expensive or time consuming to make. For example, this map of eco-friendly seafood options has generated thousands of high-quality links. You can promote this content by finding sites that write about your topic and let them know about your interactive resource. 2. Long list posts: As you can attest to, Eric, long lists posts (like your lists of ways to make and save money online), have a natural tendency to do well on social. In other words, they promote themselves with a little push. But one strategy that’s worked well for me is to find list posts that list fewer items. Then, reach out to the people linking to those lists. Because they’ve already linked out to a similar (and in this case, inferior) resource they usually have no issue linking out to yours. 3. Infographics: When done right, infographics are a link builder’s dream. But like any piece of content they have to be promoted the right way. One strategy that’s worked well for me are Guestographics. That’s where you email people about your infographic and write the little blog post that goes along with it. Quite a few Backlinko readers have had success with this technique. For someone who is just starting out with a website and wants to get eyeballs on it (without paying for traffic), what’s a good first step? What do you wish someone told you about when you first started? The first step is to make sure their site LOOKS nice and professional. I always knew design was important, but I wish someone had told me just how important it was. In fact, I’d go as far to say that design is MORE important than content. And this is especially true when you’re starting out. The truth is, people will largely judge your site’s quality based on its design. That’s why I recommend spending every cent you have on a clean-yet-professional site design. If you don’t have the money to do that, save up until you do. I wouldn’t recommend starting a blog today without an attractive custom design and logo. Let’s take a step back and look more generally at SEO and/or content strategy: If you had to take your best advice and put it into one sentence or phrase, what would that be? Ahrefs: A popular link analysis tool. QuickSprout: It’s scary, but Neil’s blog is actually getting better. Bar none the best internet marketing blog online. SEMRush: Just killer for keyword research. Especially good at finding keywords that don’t show up in the Google Keyword Planner. YouMoz: User generated content from in-the-trenches marketers. Kaiser The Sage: One the few SEOs that provide practical advice on a regular basis. Knowing what not to do is really important. What do you see people in the SEO game waste time on? I see far too many people jump on “the next big thing” in SEO, whether it be social signals or Google Authorship. One important takeaway from this interview is that SEO doesn’t change as quickly as most SEO bloggers would have you believe. People that do really well with SEO focus on the fundamentals: a great site, solid on-page SEO and link building. Thanks Brian for sharing your journey and some of your SEO insights! Did you learn anything from this interview? Do you have any questions or comments? Leave them below! I am BAD at promotion but got some great ideas here. Great interview, Eric, and great nuggets of info., Brian. As a new blogger your SEO advice is very helpful. Going to try my hand at penning a long list post! Thanks for the comment – those long list posts can do wonders for your blog! Great post. I’ve been researching SEO, SEM, Blogs for a month as I want to transition from being a computer tech to a Niche Entrepreneur. I found this article helpful and a reminder of what the foundations of SEO are. Thanks. Thanks for the comment Graeme! Brain I am quietly seeing your updates and blog postings on various websites really very Great Stuff . Very Use full to all SEOs Thank q very much. First Of all, Mr. Eric! it was wonderful, the way you delivered this article, I felt like sitting and witnessing the session. Mr. Brian is one of few people who I follow on regular basis including QuickSprout. You journey makes me realize that the lethargic attitude I had, is the reason behind the difference in growth of my blog. I would like to interview Mr. Eric and Mr. Brian if they feel that Technoratan is eligible enough to feature you both. Excellent post/interview Eric and Dean. Some valuable information here, appreciate it! Epic interview. Thanks Brian for the seo lessons you have shared here. I found your journey very interesting. It just reminded me that you can fail and be able to have the success that you wish for! I will continue to follow your blog.